Me VS. The Sugar...: My First Food Diary Day, yay! There were no pictures today for breakfast since I didn't start taking pictures until lunchtime. 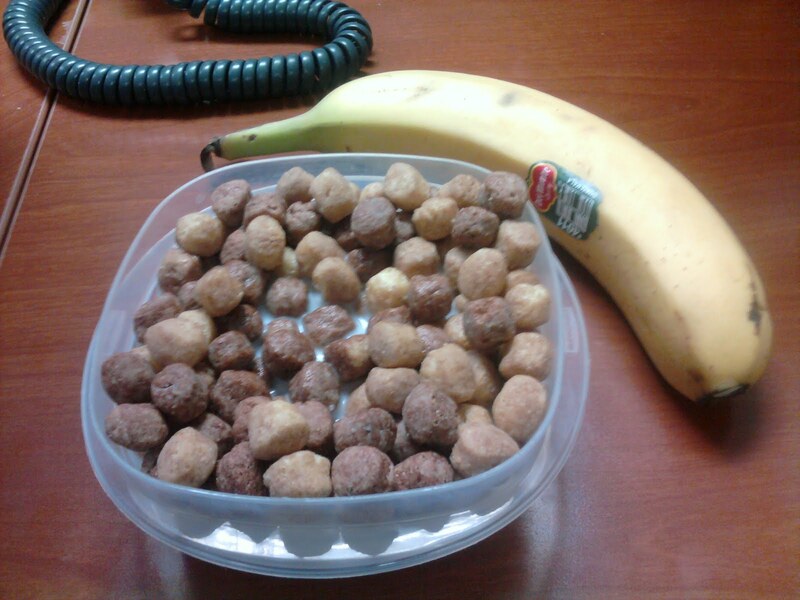 I had the standard fare, though, yogurt for my pre-workout snack. It powers me through my workouts and it's not too heavy. I went swimming this morning. I'm slow at everything I do, but I still go out there and I love it. I was running late, but I got my 23 laps in 30 minutes. That's better than nothing and it helps me manage my stress so well. I absolutely love it. Today, this was followed by my yummy oatmeal with raisins for my post-workout goodness! Of course, we can't forget about the ice coffee! 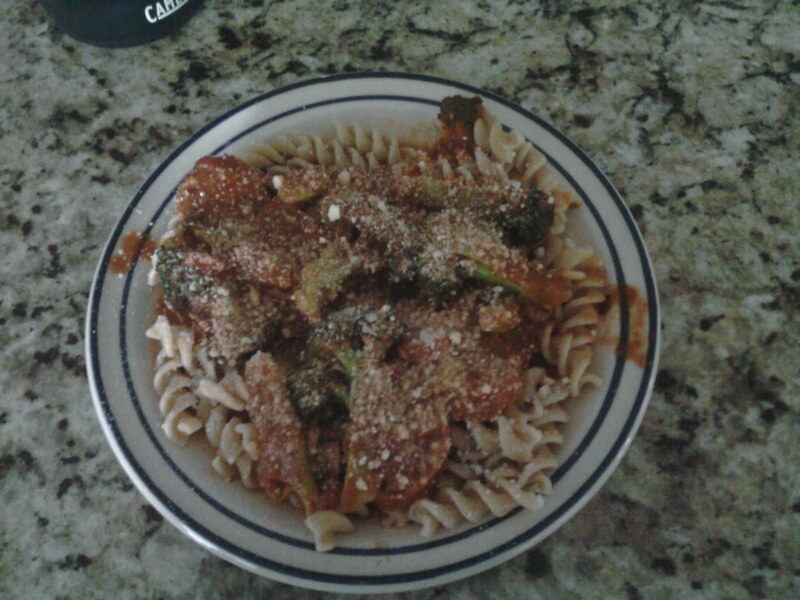 My first food diary picture, I know, not the best quality! I'm still trying to get used to my new phone and trying to take pictures with a steady hand. I had leftover whole-wheat pearl couscous with tomatoes and a type of squash that we got at the farmers market. It tasted pretty good, but I didn't realize I had to take the skin off because it was so tough. It was still good, though. I would have originally had eggs with the couscous, but knowing that I was going to start my food diary prompted me to open up that can of sardines! I know, it doesn't sound too appetizing, but it was actually quite good. The blog also made me measure out my pineapple and put it in a nice cup. Otherwise, I would have probably eaten 2 or 3 times as much from the big Tupperware. By the way, I LOVE Pineapple!!! For my snack today I had some Reese's Peanut Butter cereal. It probably has more sugar than I need, but it's oh so good. Add the milk and the banana, and it's not so bad, is it? 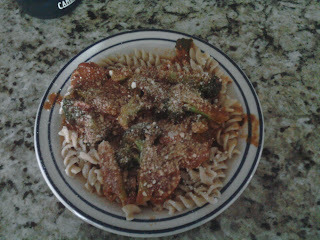 We had a yummy and quick dinner, whole-wheat pasta with an easy tomato & basil sauce, chicken sausage, and broccoli. 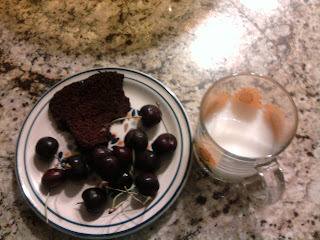 For desert, fresh cherries and a very thin slice of this chocolate chip bread we bought at the farmer's market this week. Oh so good, the lady that we bought it from can bake! It was just enough to get my sugar/chocolate fix, but not too much to make me feel bad about it. We took our doggies walking for a mile or so after dinner. We had a torrential downpour of rain yesterday that lasted for about four hours, so we drove to a paved walkway because the paths were probably really muddy. It was so humid and muggy outside, ALMOST reminded me of Houston. Turns out we have our personal mini-lagoons in our front and backyard. I'll post pictures later. Not too much reading today, only two chapters of "The Shop on Blossom Street." I didn't get to sit down until 8:45 today and much of that was setting up the blog. If anybody ever reads this, make sure to send me some book recommendations in the comments. I love to read, but can get pretty lazy about it sometimes and am easily lured by a game of Mah-jongg.